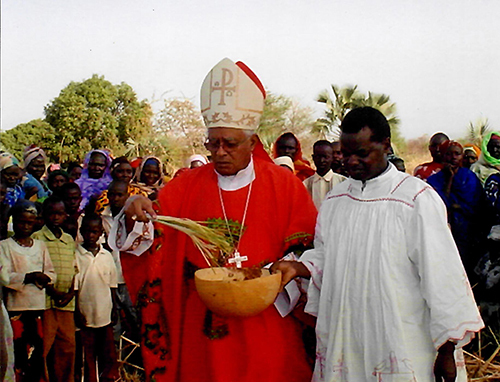 Bishop Macram Gassis, mccj celebrates Palm Sunday Mass in the Nuba Mountains of Sudan. Most Reverend Macram Gassis, mccj Bishop Emeritus of the Diocese of El Obeid in Sudan, will be speaking at Christ the Redeemer Church in Sterling the weekend of July 28-29 as part of Missionary Cooperative Plan Summer Mission Appeals. He graciously took time out of his busy schedule to answer a few questions and tell us a little something about himself. Mission Office: Where are you from and how did you come to be a missionary for your diocese? Bishop Gassis: I am Sudanese. I was born in the capital city of Khartoum. I belong to no tribe, and this is a blessing, since I can fit in any situation and in any place and in any diocese in Sudan. I come from an ecumenical family. I was the first and only priest from North Sudan and I am the only bishop from North Sudan. I also speak Arabic fluently because it is my mother tongue but English is my second language. I was educated by the Comboni Missionaries and I was attracted by their dedication and missionary life. I studied in England and in Italy and became a Comboni Missionary in 1964. Mission Office: What are the most pressing needs of your diocese right now? Bishop Gassis: The most pressing needs are: supply of food relief given the war situation in both the Nuba Mountains and the area we are serving in South Sudan and the civil strife that has caused 2,000,000 people to take refuge to neighboring countries. We need to supply clean water which is life, and at the same time we are offering education and formation to the children and youth. We combine relief with rehabilitation. Of course the pastoral aspect is very vital in such situations. In summary, the basic needs of my people to survive: food, water, medicine, and also the education of the children and youth who are the future of the church and country. Mission Office: What is one thing parishioners in the Arlington Diocese can do right now to have an impact on your diocese? Bishop Gassis: The parishioners of Arlington can assist in any of the above listed needs. The Catholic Church has become the referral point of the people since the authorities do not meet the needs of the people. For example if a community needs clean water they will not appeal to the government or the Liberation Movement. They will come to the Church. Likewise if they need food, they will come to the Church. Mission Office: Tell us a story about how contributions to your diocese have made a difference in someone's life. Bishop Gassis: With the contributions I had received it was very vital to purchase and supply mattresses for the patients at Mother Theresa Hospital. I visited the wards and was shocked to see the condition of the mattresses they were using. They were not only dirty and smelly but they were even consumed. I personally went and ordered new ones and purchased new bed sheets and blankets. Many of the patients come from remote villages without water to bathe. In the hospital they are bathed clean and have decent beds and clean covers. Similarly, the Missionaries of Charity collect vagrant kids, wash them, dress them, and offer them a basic education. They are completely renewed and eventually they join the regular primary school in the area. Without the contributions we get we would not be able to give hope to our suffering brothers and sisters who live in the war zone. Mission Office: Are there any Americans serving as missionaries in your diocese right now? What do they do? Bishop Gassis: I used to have Maryknollers but as time went by, the last Maryknoll priest had to leave us. Presently, besides the local church, we are assisted by personnel from Eritrea, India, Mexico, Australia, France, and Kenya. They are doing pastoral work in education and health. Mission Office: What is the most important thing you want the parishioners of Christ the Redeemer and the Arlington Diocese to know about your mission? Bishop Gassis: I invite my brothers and sisters to join hands with me and walk with me and pray with me asking the loving Jesus to take away from us this bitter cup. Many, many children have died and suffered because they were not loved. Besides our appeal through prayers, I appeal for caring and sharing. Support Bishop Gassis. Donate now! Bishop Gassis will be speaking at all weekend Masses at Christ the Redeemer Church, 46833 Harry Byrd Hwy., Sterling, VA 20164.